Visual: Pale brackish grain. Slow thin streaks come from the spirit. Nose: Thick. Peaty. Oily character. Light menthol and moss notes. Peppermint. Water adds dust balls and soot. Slight salt. Body: Thick. Oily. Toffee and caramel. Thick peat. Oily charring. Oily chocolate. Oily peppermint cream. Water makes creamier. Salt touch. Honey. Sweet apricot. Sauternes wine. Sherry trifle. Finish: Peppermint cream. Peat smoke. Light charring. Water adds dessert wine notes. Conclusion: this is not what I expected, not at all. The extra abv seems to have utterly changed how the Machir Bay whisky expression comes across. At normal abv strength this seemed slightly light back when I last tried it – very enjoyable and complex but gentle. This booms with oily thickness in feel, matched with huge honey to trifle sweetness. Everything feels like it is delivered in a oily fashion – oily peat, oily chocolate, oily charring, and now added to that is a completely new element -oily peppermint notes. This minty menthol to peppermint character is fresh yet creamy and adds both a sweetness and a slight natural mint leaves that I did not find in the standard expression. It makes it feel fresher, bigger and more greenery touched, adding to and massively changing the overall character. This Islay character Kilchoman have become well known for is more subtle here than in a lot of their expressions. It is smokey, slightly salt touched, but the huge, thick oily and sweet character used here means that the sea breeze and peaty characteristics are less prominent that usual. Instead the apricot spirit note I have noticed at the back of Kilchomans before is now pushed to the forefront here in big dessert wine like flavours. Oddly considering what makes this so different is what the extra abv brings to the game, this actually works better with water. Only a few drops are needed to bring out the best, so it is still a lot higher abv than the base expression, but those few drops make it smoother and really bring out the sherry trifle complexity from below the oily character. Again the distillery does brilliantly – a sweet dessert wine meets Islay whisky that is rewarding on every level. Highly recommended. Background: Second of the samples I was given by Independent Spirit for doing notes on, many thanks! They had done a Kilchoman tasting night I had to miss, but kindly let me try this – an exclusive bottling for the 2018 tour. It is a cask strength take on the Machir Bay which I was already a fan of. This was tried directly after the prior Kilchoman tasting, so I was still listening to the new Spektrmodule podcast. Visual: Moderate gold colour with fast thick streaks coming from the spirit. Nose: Smokey. Lightly salty. Sea breeze. Raisin loaf. Charcoal dust. Spicy. Turmeric. Seaweed. Water adds greenery and moss, plus a mix of rocks and salt. Body: Sherried raisins. Smoke. Dried smoked beef. Paprika. Light custard sweetness. Drying alcohol. Water adds cherries, makes very smooth. Peaty. Light apricot. Finish: Soot. Salt touch. Dried smoked beef. Overcooked streak. Malt loaf. Water makes beefier in a broth style. Malt chocolate and a red fruit touch. Conclusion: This is both distinctly forceful Islay in its style, and yet somewhat restrained with great subtly being showed in the openings this provides. The sherry use isn’t overpowering, but instead interwoven throughout the whisky to add light extra spice, and a little extra sweet dark and red fruit character. It adds a gentle sweetness that smooths the edges of a solid Islay core. So, lets talk about that solid Islay core then. It is restrained but still evocative of the sea breeze and wet salted rocks of Islay, showing sooty smoke and dried beef to overcooked steak meaty roughness. So, distinctive as an Islay but not leaning into the punching medicinal or peat assault of the more intense ends of the scale, just weighing in with a character that brings imagery of a seaweed laden rock pool and wild island character that the region espouses. It is very well done, layered and expressive. Water brings out more subtleties from the spirit – cheekier red fruit, but more tellingly an apricot sweetness that seems to belong to the spirit itself rather than the sherry ageing. An odd element but one I have seen in the background of a couple of Kilchoman now. The Islay character is still the core, but the more restrained expression lets a surprising amount of lighter notes through to play. This is very good indeed – as mentioned in the background, I had the choice between buying a bottle of this, or the port aged cask, and I really feel I should have bought this expression instead back then as this is very impressive. Subtly understated, rewardingly solid – this is a Kilchoman that brings weight and range from the sherry but is not lost to it. Very highly recommended and my respect from this distillery is rising with every expression I try. Background: This is the first of two samples I was given by Independent Spirit for doing notes on, many thanks! They had done a Kilchoman tasting night I had to miss, but kindly let me try this, a sherry aged take on the spirit. This came out at the same time as the port cask, and back then I decided to go with that expression over this one. Time to find out if that was the right choice. Warren Ellis had put out a new Spektrmodule podcast – a collection of ambient and haunting music, so I put it on while doing the notes. Visual: Bronzed with a red to rose wine hue. Fast thick streaks come from the spirit. Nose: Oily. Burnt tyres. Potpourri. Rose wine. Toast. Petals. Ash and smoke. Cold cellars. Brown sugar. Body: Strawberry. Tingling alcohol. Dusty. Charred toast and brown bread. Soot. Water adds peat, cherries, perfume air, soft cherryaid and salt. Finish: Dusty. Toast. Salt. Red berries. Muted red wine. Malt drinks and malt chocolate. Water adds toffee and caramel. Riesen chocolate chews. Soot. Dried apricot. Cherries. Conclusion: Ok, this is a lot better than my first encounter with it at a whisky tasting night. It probably helps that this time it isn’t the fourth whisky in the rotation, plus it has had some time to breath. Anyway, back then I was worried that I had grabbed a dull one and had it waiting for me at home. Now? Well let us see. Neat it is still lacklustre and a bit closed. It is a mix of sooty and perfumed in the body, which was weird as it had a very enticing oily aroma enticing you in, just seeping slowly over the lip of the glass, but the actual sipping of it gives none of that. Without water that closed nature means you get very little of the port influence. It actually felt kind of toast like – quite drab. Water makes a big different. It is still slightly closed and more sooty than peaty, but now it has subtle red fruit in the body, and that element raises more the more you add extra water into the mix. I find it odd as it is muted in the red fruit and muted in the Islay characteristics – both individual elements feel weak, but together it is more than the sum of its parts. The subtle red fruit behind soot works better than I would have imagined it would. Grounded, ash over muted red wine and cherries. Still not great one, but somehow these elements come together to accentuate each other well. So, not as good in my opinion as the demand for it would suggest, especially before giving it some time to air where it was very closed. Now, well it is a solid sooty, smokey whisky against good use of port. Well with water at least. I respect it, but can’t say I would recommend it highly against the other Islays or even the other Kilchomans. Interesting as one of the little done port aged Islay, but far from a must have. Background: Had this for a short while before trying – I had to grab it fast as it is one of 10,000 bottles and they flew off the shelves. Kilchoman has been a lovely new Islay distillery, and I’m generally a fan of Port Cask ageing so it seemed like a must buy. I was a bit nervous though – after buying it I had tried it at an Independent Spirit Uber whisky tasting and found it kind of average- plus on immediately breaking this open the first dram seemed similarly mediocre. Still, as I do with whisky these days I left it a week or so after opening before doing notes – lets see if a bit of time to breath has helped it. Put on some of The Royal They while drinking – their mix of quirky tunes yet solid lyrics delivered often in a more upbeat sound than the actual message would lead you to expect has made me a fan. Visual: Rich deep gold with thick streaks from the spirit. Nose: Smokey and peaty. Wet rocks. Salt touch. Big aroma. Brown bread. Kippers. Water adds vanilla and light apples. Body: Smooth mouthfeel with caramel, fudge and vanilla. Warming. Beefy. Peaty. Stew character. Salt. Water adds apples with cinnamon. Sherried raisins. Nutmeg. Dried apricot. Oily. Finish: Medicinal. Salt. Brown bread. Paprika spice. Dried raisins. Dry cake sponge. Malt chocolate. Light peat. Dry in general. Water adds cherries, sherry and now juicy raisins. Creamy coffee. Menthol. Caramel. Conclusion: There is a nice mix to this – I’m going to break it down into its layers and examine each individually as there is a lot going on here. On first pour you get a big booming aroma that you can’t mistake for anything but Islay, and it is recognisable from metaphorical miles away from the glass. Classic Islay peat, smoke, salt and rocks all delivered thick and oily. Drinking a sip keeps the thick character, but now with that peat expressed in a beefy style – layered over thick caramel and fudge notes. It is a dry sweetness, very chewy, very big and a great backing and contrast for the big Islay flavours. The finish finally shows the story of the sherry influence – coming in as dry spice and raisins over the, still showing but now medicinal, Islay character. All of the levels has alcohol warmth, but the texture is luxury level smooth. So, what can water do with this then? Quite a bit actually – soft green fruit and sweeter spice notes while the sherry influence ramps up nicely giving cherry and sherry notes into dry nutty finish. Well the finish was always quite dry – I forgot to mention that before. Forgive me please there is a lot to get through here. Anyway, compared to the chewy main body the finish is a nicely done dry underlying, drawing a line under the experience. So, yeah, the fact I’m forgetting stuff while trying to get the notes done is showing how much this has going on – huge peat, big Islay, big sherry, yet with enough room to show the lighter notes. Big, but not so big that it becomes simple from overpowering notes. It lacks only that “je ne sais quoi” to make it an all time great, but it is as good as you can get without that. Bloody nice. Background: Another chance to dip into Islay’s youngest distillery – not got much info on this one. It’s a no age statement made with a mix of bourbon and sherry casks. Grabbed in ickle mini form from Independent Spirit so I could give it a try. So lacking in detail on the whisky – I listened to a collection of No Doubt’s single while drinking this. While I didn’t like all of the musical directions they took they were always good – just some of the tracks were not for me. When they were at their best IMHO was when they took on topics akin to the punkier scenes I enjoy so much, but delivered in such a way that it reached a much wider crowd without descending to the saccharine Spice Girls style “Girl Power” delivery. So there you have it. Visual: Very pale greened grain. Nose: Dry. Smoke. Salt. Astringent. Rocks. Crusty bread. Salted lemon. Body: Initially light. Vanilla sweetness. Salt. Moss. Slight raisins. Smoked beef. Sherry cream. Slight alcohol tingle if taken neat. Water makes more toffee and sherry sweet and brings out salted lemons. Finish: Slight sherry trifle. Dry medicinal notes. Vanilla sweetness. Brown bread. Smoke. More trifle with water and adds salted lemon. Conclusion: Ok, I may just be tasting salted lemons in everything since drinking Kiln Embers. Keep that in mind whilst reading these notes. Aside from that note let me say this is an interesting wee whisky. Unlike the 2007 expression it needs a touch of water to work, not much, just a drop or two, but it is still just a little fiery neat. Despite that it feels light, not in a bad way, but in that – while salty and lightly medicinal, it does not have that booming character of the more prominent Islays. This allows more subtle elements to be there – the sherry trifle, salted lemon and vanilla toffee don’t need to be loud to be heard in the mix. Again, this is with just a slight amount of water that really lets it open up. 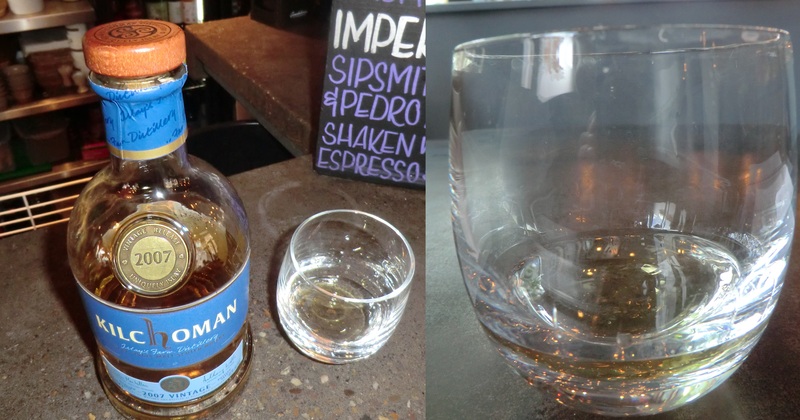 Initially it seemed a slightly simple, lightly medicinal whisky, but as the sweetness came out it started to portray distinct elements from both the sherry and bourbon ageing and I realised there was more to this than meets the eye. It does not eschew the traditional Islay character, but it more uses it to call the sweetness into contrast. Not what I expected, a very easy drinking Islay that manages to keep the Islay character. Very nice. You know, I kind of hope there is at least one bad whisky in this set. Not because I want bad whisky, but at this rate everyone is going to be claiming I am a paid shill. Anyway, the whisky calendar is doing well so far. Background: Ok, (mostly) copy paste time again. ” Ok, bias warning first: This is a part of the Masters Of Malt Whisky Calendar given to The Bath Whisky and Rum Club, part of Independent Spirit, who invited me to assist with the notes in return for uploading them to alcohol and aphorisms. Sounded a very fair deal to me. Also, due to this we each only had half of the 3cl bottle so thoughts are based on a smaller exploration than usual. On the other hand I could not say no to the chance to try so many new whiskies. Many thanks!” New info! Ok, from my research this is a mix of five and six year old whisky from oloroso sherry and bourbon cask, which is unusual for Kilchoman. And by research I mean that is pretty much copied directly from their website. Sorry. Drunk while listening to even more Crossfaith. Yes I did do this set of notes immediately after the last, why do you ask? Visual: Greened grain. Very light in colour. Nose: Dry earth. Peat. Astringent. Body: Beef stew. Golden syrup. Peat. Sweet lime. Dried banana. Smooth. Charred oak. Water softens and brings barley, malt chocolate, some peat and energy still, and a tar like touch. Finish: Dry. Smoke and warmth. Sweet syrup. Maybe a raspberry syrup like touch at one time? Possible psychosomatic. Peat. Beef slices. Malt chocolate. Salt. water adds a custard sweetness. Conclusion: The newest Islay has always impressed me in prior encounters, and here is the first time I have managed to put the impressions of being impressed on indents (or impressions if you like) on the paper. It is a whisky that really shows the Islay character, you can feel a barley like texture running across the tongue, the smoke rising, and a robust peat warmth the builds up inside you. It doesn’t just define itself by the expected character though – there is a mix of sweeter notes from dried banana to several sweet syrup notes, and they give a more subtle set of lower notes that back against the big Islay beef broth of the main character. The subtle elements are what makes it stand out from the pack. It is still a booming whisky, especially neat, yet for all its youth in years it manages to give you all of the warmth and yet none of the fire. Even at this point it is showing very distinguished characteristics, and that bodes well for the future. It will be interesting to see what happens, as in later years peat tends to drop slightly, and I wonder how the lighter elements will progress. This is balanced, big, intricate and evolved. The barley character grounds it, and gives a texture you don’t see often with whisky these days, the peat lets it boom and the sweetness lets it mellow. A great whisky already, and a promise of special things ahead in the years to come. Background: Bottled 2013. With this I get to call full house on Islay bingo. I have now reviewed one expression from each distillery there. Which was not the reason I bought a measure bit it didn’t hurt. I’ve tried a few Kilchoman’s at whisky shows over the years, but have yet to do a review from this, the newest Islay distillery. A quick bit of research shows that the distillery not only does its own floor malting, but also has all parts of the process from growing to bottling, on Islay itself. Yes by research I mean “I looked on wiki”. Yes, I know that doesn’t count. This was drunk at Brewdog Bristol in their new, slightly rolling tumbler glasses.